The rights of the States were taken away during the Civil War. While the Republic had the Federal Government subservient to the needs of the States, under the Corporation the States have been relegated to assets of the Corporation. This is in the process of being challenged and changed. The movement to make marijuana legal in a given State, puts the State on a collision course with the Federal Government, which still (unconstitutionally under the Republic) makes it a Federal crime to grow and posses marijuana. As each State realizes the financial benefits of marijuana’s legalization, the States will defend this right to make decisions regarding marijuana within their own borders. This is a State Right question that will eventually challenge the basis of Federal laws, which are unconstitutional under the Republic. Why am I so certain marijuana will bring down the UNITED STATES Corporation? Simply because that little plant is the key to bringing down Big Oil. Without Big Oil in control, POO (Power Over People) is endangered. Hemp farming depicted on the 1914 ten dollar bill. Marijuana has not been proven to be detrimental to either the human mind or body. In fact, its medical uses are astounding. The only reason it is illegal is to keep hemp illegal and hemp does not get you high. There are over 25,000 uses for hemp. Every product in Big Oil’s inventory can be replaced with biodegradable hemp products! In 1553, the English King fined farmers, who did not grow at least a quarter acre of hemp for each 60 acres of arable land they owned. You could pay your taxes in America with hemp, from 1631 through the early 1800's. In 1850 over 8,300 American farms were dedicated to hemp. Refusal to grow hemp was illegal in America through the 17th and 18th centuries. All the Founding Fathers who owned farms grew hemp. 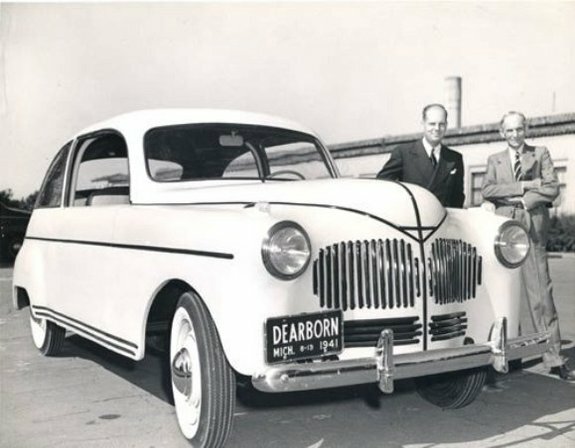 Henry Ford’s first automobile was composed of plastic made out of hemp and the car ran on hemp oil gas. The plastic panels on the car made from hemp was estimated, by a 1941 “Popular Mechanics” article, to be ten times stronger than steel. “Mechanical Engineering Magazine” in 1938, determined that using 20th Century technology hemp would be not only be the largest crop in the world, but also the most profitable and desirable crop in the world. From the US Department of Agriculture in 1942 came a film entitled “Hemp for Victory”. 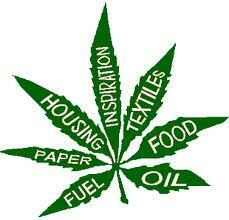 The USDA in Bulletin #404 stated that hemp produces four times as much pulp as cotton with 4-7 times less pollution. Its growing season allows for 3 crops versus 1 of cotton, and does no damage to the soil. Weeding is not required because the height of the plants and dense leaves allow no room for weeds. Fertilization is not required. 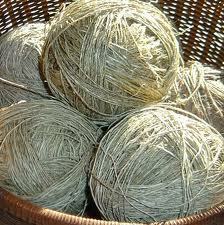 Hemp is 8 times stronger than cotton and air-permeable. It can be grown almost anywhere. A single acre of hemp would save 4.1 acres of trees in making paper. The paper itself is stronger and incredibly long lasting, without yellowing. 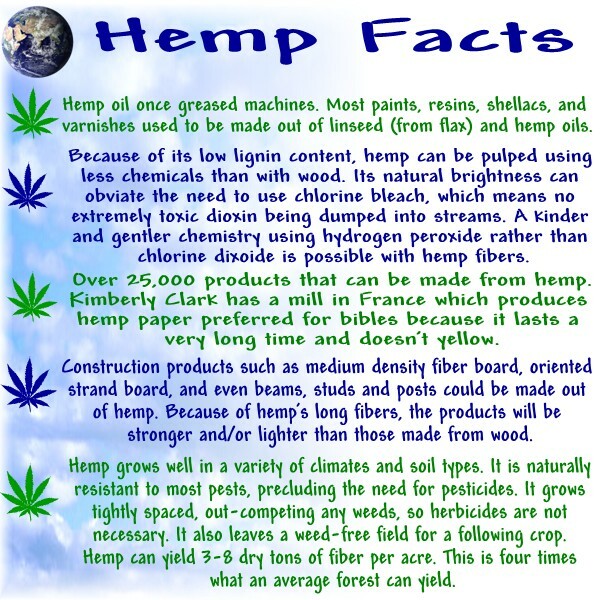 Hemp can also replace all other lumber products. Trees living and standing are a way to help control climate. Unfortunately the Hearst Paper Manufacturing Division of Kimberly Clark did not want hemp competing with their vast amount of timber land. Dupont began patenting and producing plastics made from oil in 1937, and 80% of those products could be duplicated using hemp. These and others began using the Mexican word “marijuana” in place of hemp, and blitzed the American people with the terror of marijuana from print to films. Then they stacked the government with their own cronies. In September 1937, hemp became Federally and unconstitutionally illegal. The most beneficial crop known in the world was declared by Congress, to be an illegal drug and we have been suffering since. I could seriously write an entire book on hemp and the marijuana conspiracy. Just for instance, the hemp seed is the most nutritional food source known. It could end world malnutrition. The stranglehold of Big Oil could be ended. Hemp clothing could be handed down to your grandchildren. Medical benefits would impact Big Pharma’s pill pushing toxins. Even cement can be made from hemp. When the next nationwide Occupy Wall Street type movement happens, may I suggest every single person joining the protest, go to the local police station and turn themselves in for possession of marijuana. Someday having a record for marijuana possession and growing it, will designate you a hero of the American Republic. Note: One friend checked up on my claims of hemp’s ability to replace Big Oil. He said his research determined hemp would not be economical. I have no doubt his research did conclude this. But Big Oil has had almost a century to work toward decreasing production costs. But it all boils down to paying more for awhile versus fracking. No decision here for me.